Shawls come in all shapes and sizes and can be used for a million different purposes. There is no ‘perfect’ shawl shape, each is useful in different circumstances. Sometimes you want a giant shawl that can double as a blanket, other times a narrow one is needed as a scarf or maybe you need a delicate light one as a decorative addition to a special outfit. 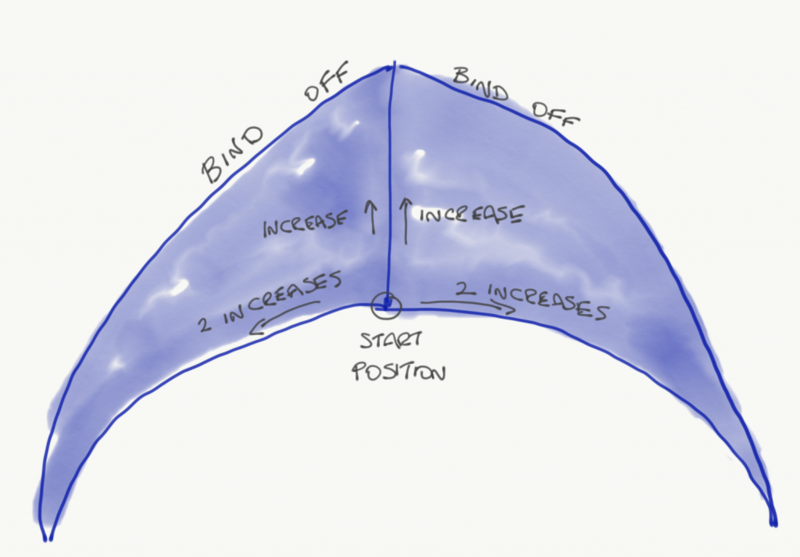 The way you construct a shawl will have an impact on how it’s shaped; you ‘push out’ into the place you’ve got an increase and ‘pull in’ where you’ve got decreases. Usually, you start shawls with a few stitches and increase to create the shape but it’s also possible to start with all the stitches on the needle and decrease away to nothing. You can even start with your edging and pick your shawl up from that. So let’s take a look at some of the more common shawl shapes and how you work your increases or decreases to make the shapes. If you understand the shapes it also helps you see how any modifications you make when you knit will impact the shawl shape. Let’s start with side-to-side shawls that can vary from a wide scarf to a full-size shawl. These are excellent for working shawls in one piece and you can have a continuous edge pattern worked along the bottom of the shawl. 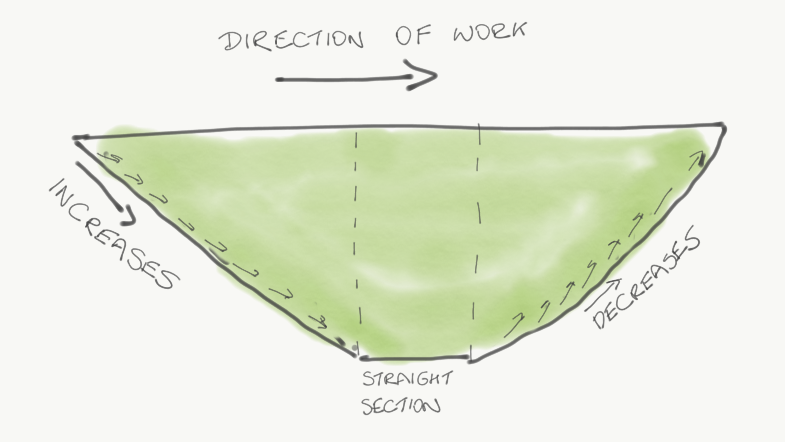 You start with a few stitches, work increases along one side, work a straight section in the middle and then work decreases along the other side. If you have a small amount of increases and decreases you will have a narrower shawl and a greater amount makes a deeper shawl. You can even add short row wedges in as you work to add extra width to the bottom. I’ve got a couple of examples of this shawl type; Uisce is a narrow example and Birman is the same construction type but worked much wider. Uisce – narrow version of the side-to-side shawl. Birman – wider version of side-to-side shawl. This is frequently the first type of shawl a lot of us learn. It’s really fun to watch a shawl shape emerge out of a tiny garter tab at the top of the shawl! You begin with a few stitches that are worked in garter stitches for several rows (Garter Tab) then you pick up stitches along the side of this tab. 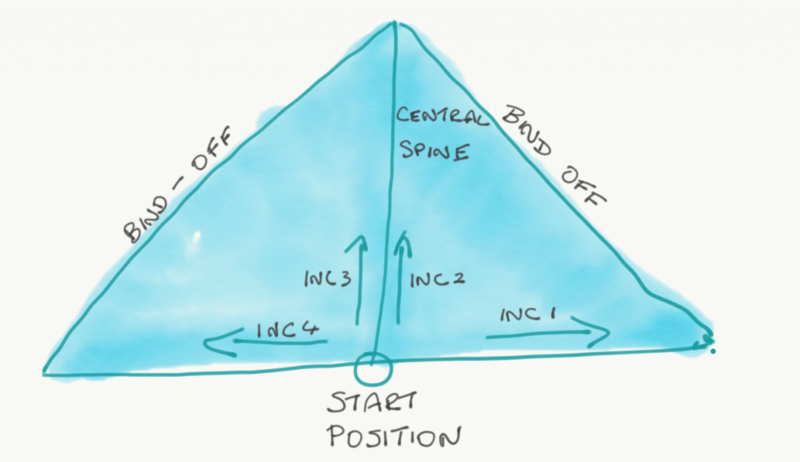 From here you work increases along each edge and at each side of the central stitch (central spine). This creates a triangle shape that grows out from the central point. You can use the shape for stripes, texture, lace or even cables adding in repeats as you have enough stitches from the increases on each side. You can vary this shape a little by making the central spine larger and having a pattern worked along it. Here are a few examples of triangle shawls I’ve designed; Centrique and Feamainn. Centrique – Basic triangle shawl with a central spine. Feamainn, a triangular shawl with a central pattern panel. The basics of this shawl type are the same as a triangular shawl with one difference, you’ve got an extra set of increases along the edges. This changes the shawl shape into a curved ‘wing’ shape that becomes much wider but has beautifully curving edges. I really love how the edges of this type of shawl curl! Mylio uses this type of construction and you can also see that the central spine is moving outwards to accommodate an enlarging lace panel. Mylio, extended wing shawl with central lace panel. In my Knitting With Rainbows book, I used a lot of different shawl shapes to show off gradient yarn. I’m in the process of releasing the individual patterns from this book which has really focused my mind on shawl shapes right now! You can even pick up the latest Half Moon Street kits here. I’ll be back next week with more shawl shapes. Do you have a favourite shawl shape? I am a little confused about the first shawl (side to side shawl) Where are you casting on? You start at the left ‘tip’ with just a few stitches and you work your increases from there until you reach the depth of the shawl you want. This is awesome. I love how your designs take a shape I’m familiar with and incorporate a surprise detail or technique.